The rate-board above the ticket counter calls it an “ice-sleigh”, which in the cold month of January, still conjures up images of Santa’s sleigh. 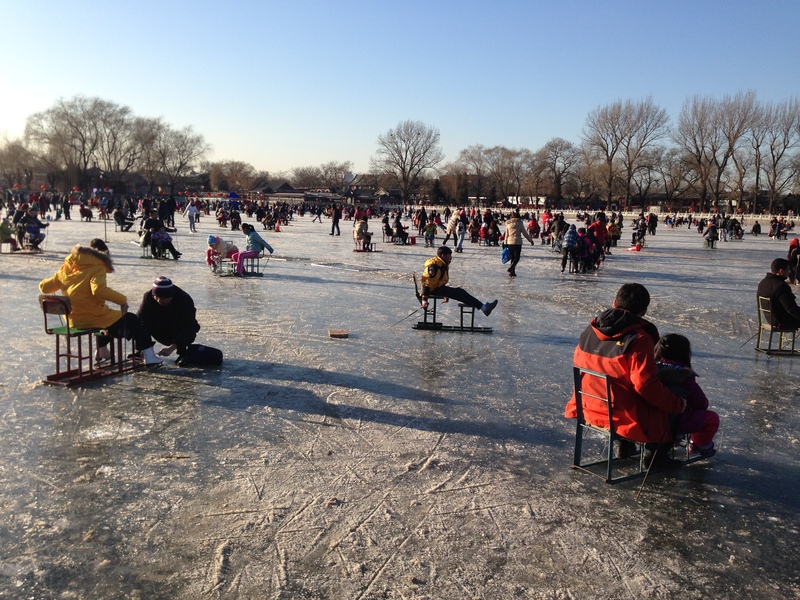 But that is too fancy a word for what we rode yesterday –school-kid sized metal chairs welded to L-shaped metal angles serving as runners to skate on ice with no brakes and no steering. These contraptions, best referred to as chair-sleds, typically had a smaller metal stool welded a little in front of the chair making the sled a two-seater. A mock steering wheel up front made of a small metal ring gave something to hold on to. The adornment included chipped paint in primary colors and seats covered with patches of office carpet. Screwdrivers welded to pointy iron bars served as steering poles, enabling the riders to propel these wonderful contraptions with great glee! 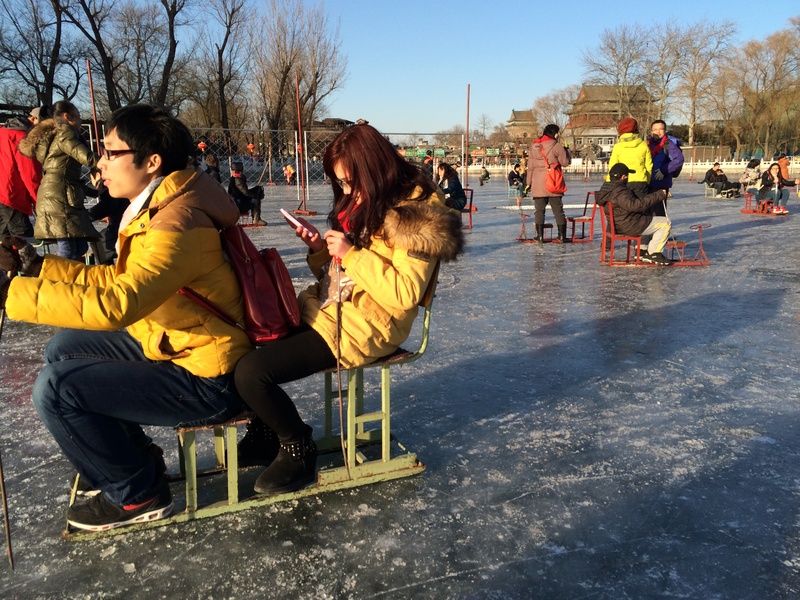 Chair-sledding is a quintessential Beijing experience. 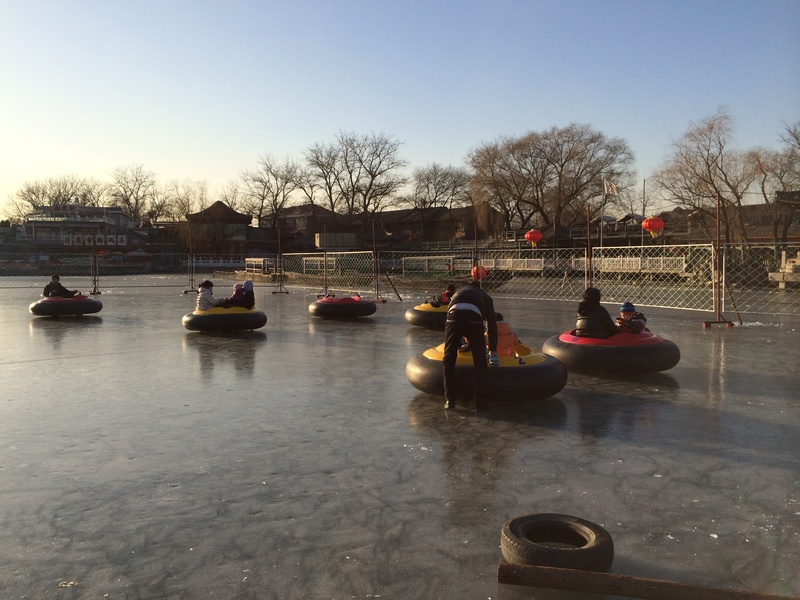 People can be seen enjoying sledding, as well as skating and playing ice hockey, or simply walking to school, on frozen canals in many parts of Beijing. 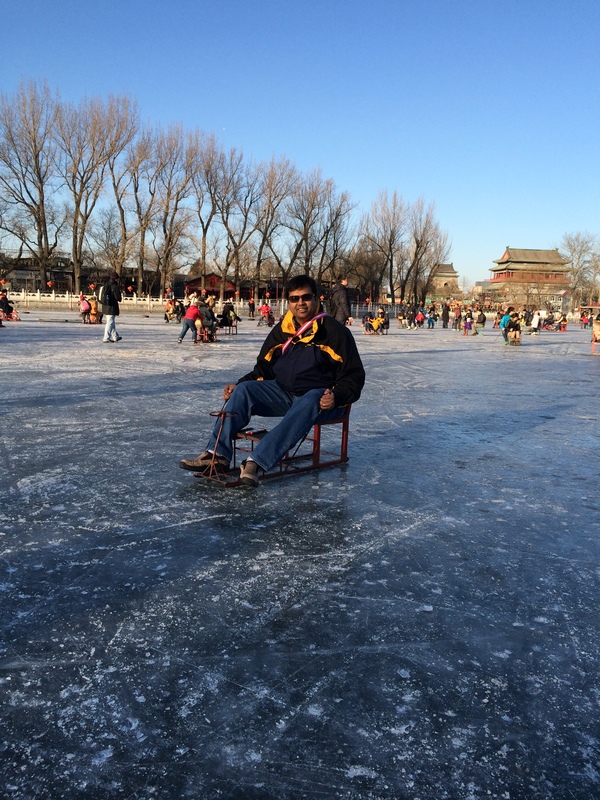 But nothing can top the chair-sledding experience at Lake HouHai. 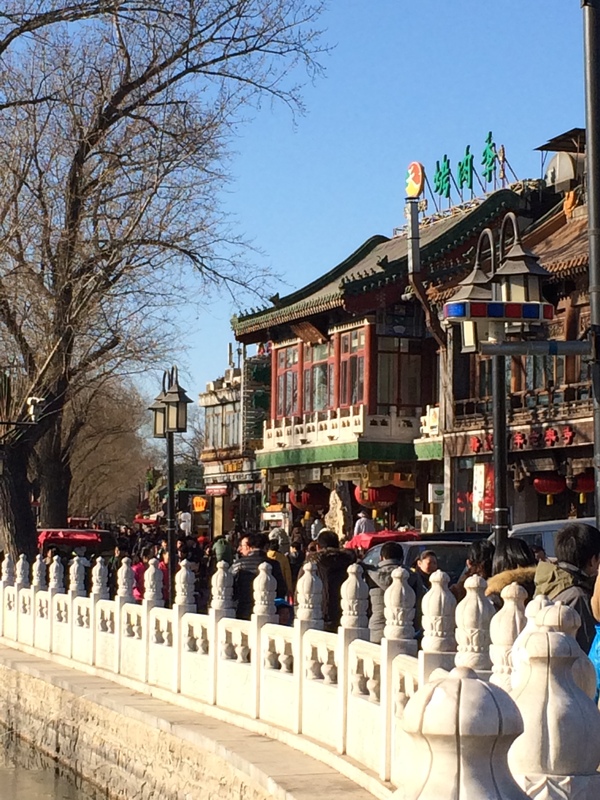 Lake HouHai — a centuries old lake located close to the Drum Tower (Gu Lou) in central Beijing — is anyway worth a visit at any time of the year. Dating back to the 11th century, it’s a long lake with a narrow ‘waist’ at the center that is just wide enough for two paddle boats to pass each other without too many bumps. This lake center is spanned by an old arched pedestrian bridge in stone and is the hub of activity at Lake HouHai. 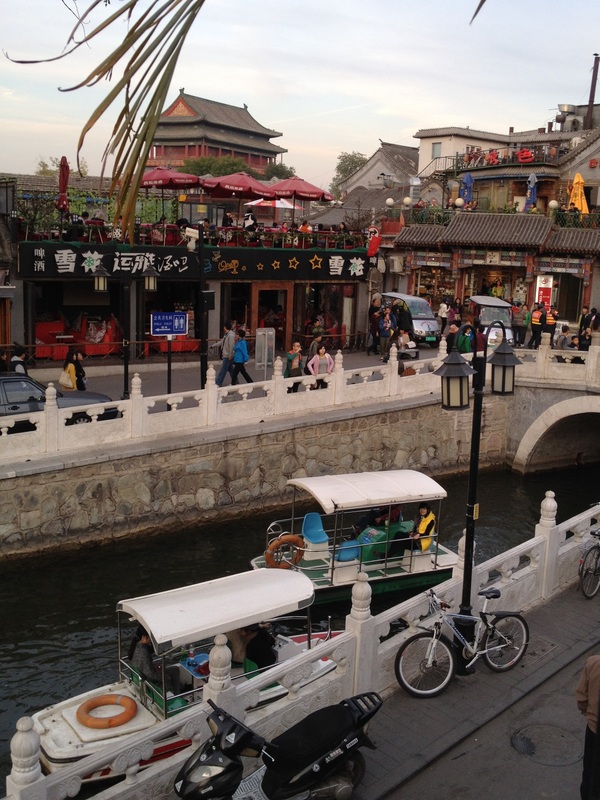 All around the bridge, and really going all around the lake in either direction, the streets are chock-full of bars, shops, and restaurants that are lit up by a million lights at night and are a favored hangout of youngsters and expats. 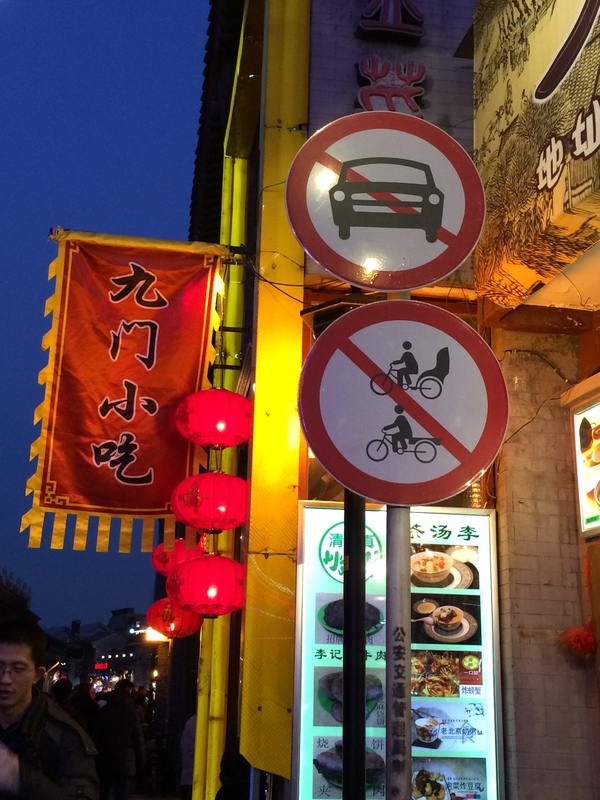 The streets are mainly pedestrian except for the occasional car that gets in mysteriously, and the not-infrequent red pedicabs that are another quintessential Beijing feature. 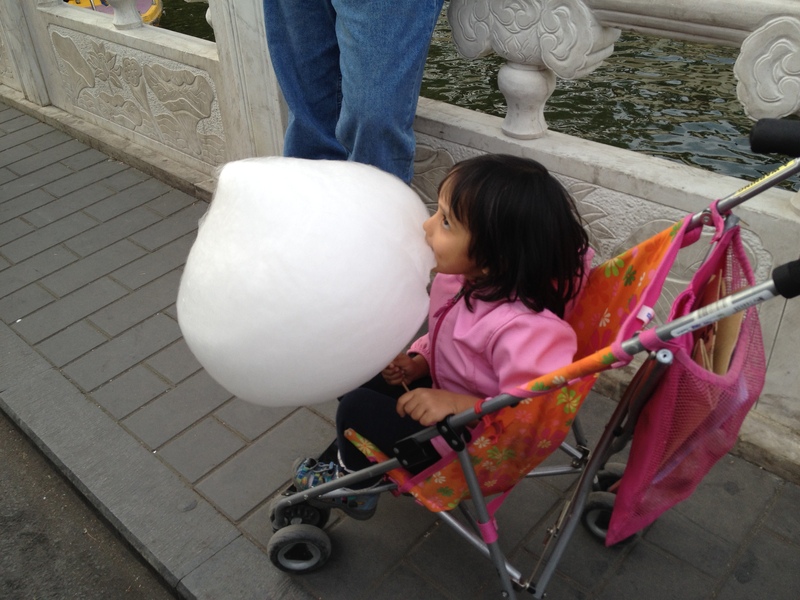 Walking on the stone-paved streets under the willow trees that line the lake, eating gigantic cotton candy while jostling with hundreds of fellow visitors, it’s an experience not to be missed. 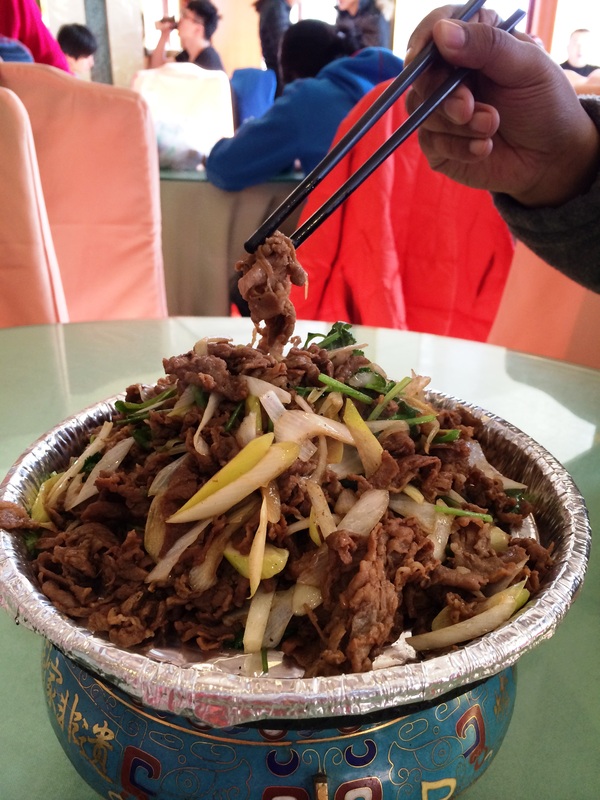 Getting to Lake HouHai is an experience in itself. You can’t drive up and park next to it. 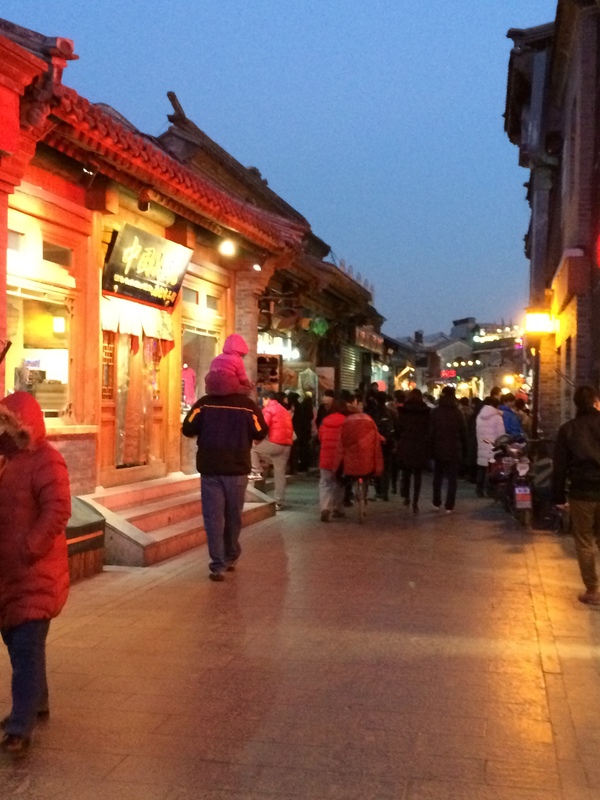 The only way to get to it is by walking through one of the historical old hutong neighborhoods with tightly-built courtyard-homes surrounding the lake. 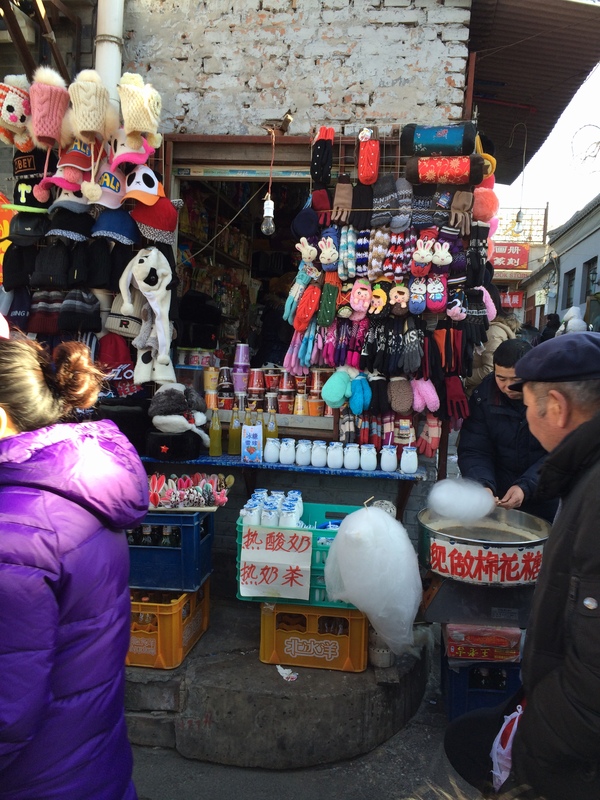 My favorite way to get there is by parking close to the Drum Tower (GuLou) and walking along YanDai XieJie (skewed tobacco pouch street). 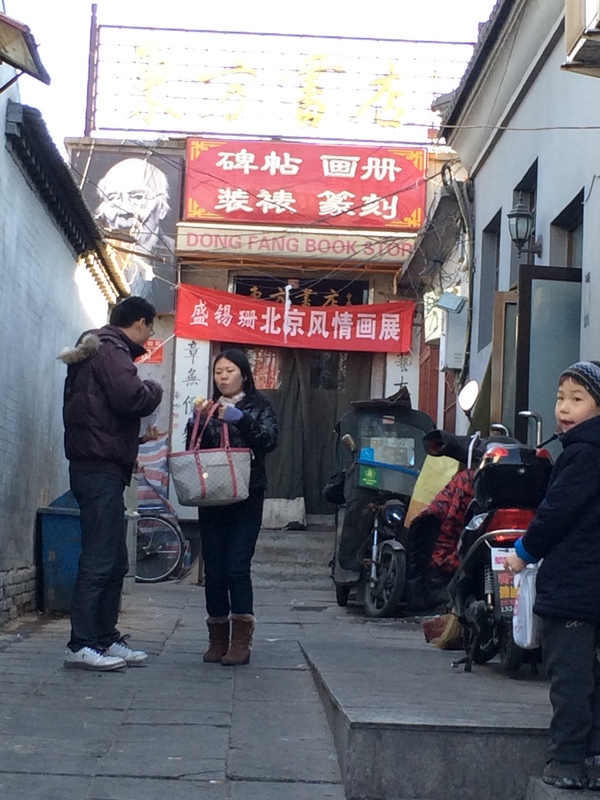 Apparently, there were many smoking pipe stores along the street in the Qing Dynasty (17th to early 20th century), hence the name. This street leads straight to the central bridge over the lake. 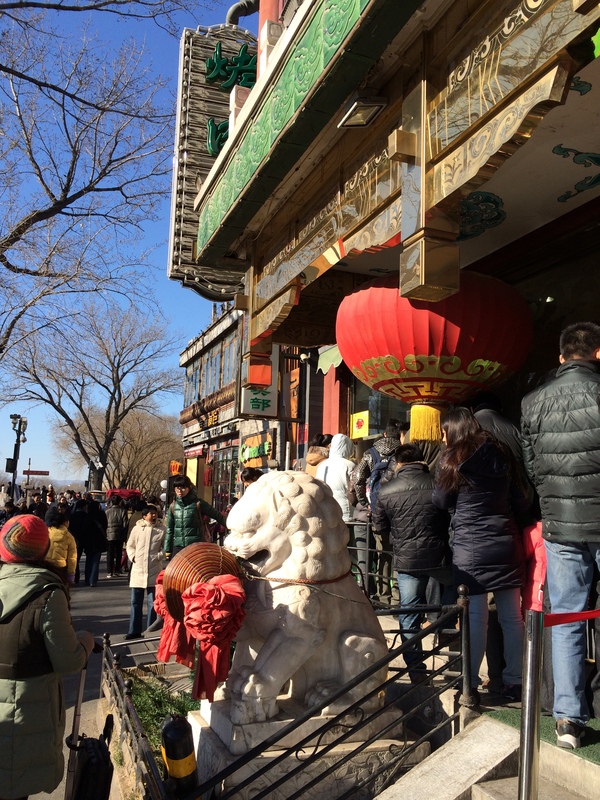 It was redeveloped in 2007 to preserve its historical character and, although not original, it has a great atmosphere with street hawkers and shops selling antiques, unique Chinese and Beijing gifts, handicrafts, and of course, smoking pipes. 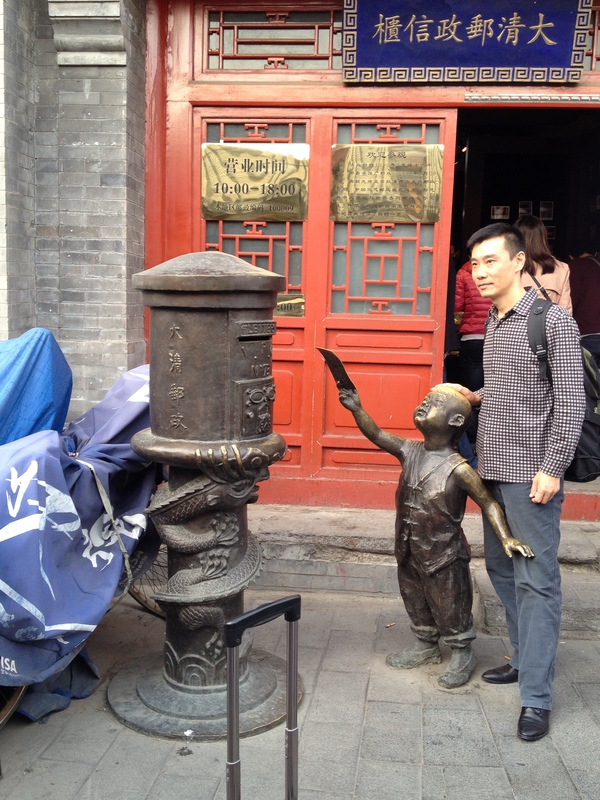 There is even an old post office with a lovely brass statue in front of a child posting a letter – a favorite prop in many visitors’ pictures. 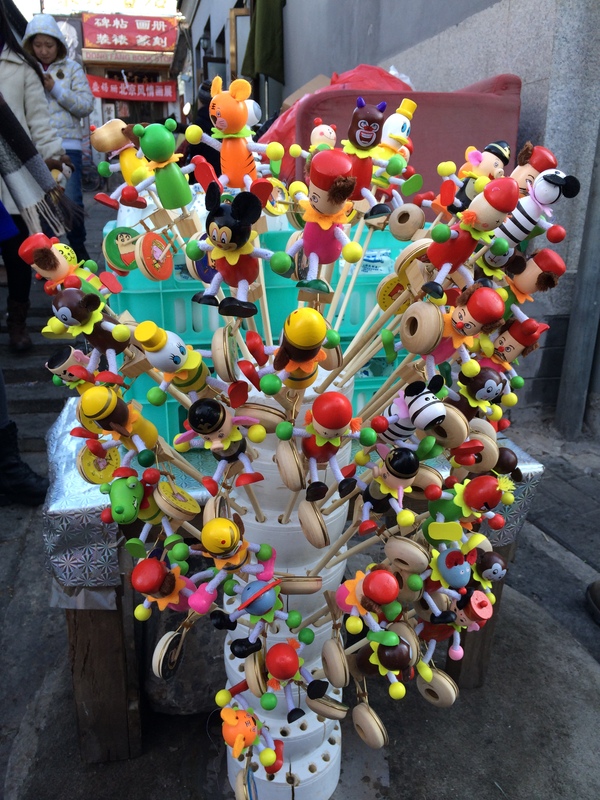 Unique restaurants and snack shops line the street. We now headed south to our chair-sledding adventure. Long lines at the counter, although fast-moving again, and a confusing array of choices made for a slow start. 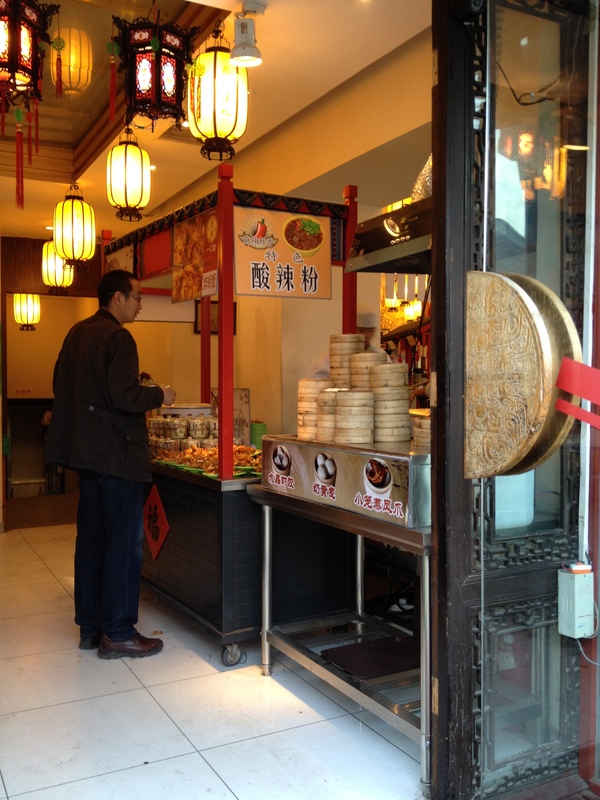 Luckily a fellow expat walked by and helped out with choosing what we wanted. FYI: the ‘ice-slide’ is a playground-style slide made of ice that you can take turns to slide down on; if you want to chair-sled, you want the ‘ice-sleigh’. 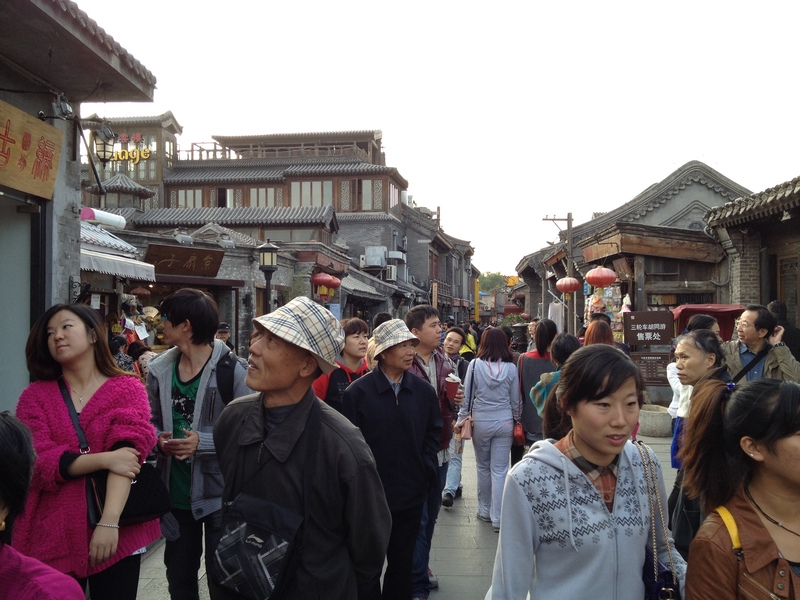 Also, no entrance fee is noted anywhere but we were charged 20 RMB per head at the gate. A couple of Chinese youngsters who were equally confused said it looks like there’s some cheating going on, but it was impossible to verify without knowing Chinese, so we had to shrug our shoulders and go along. 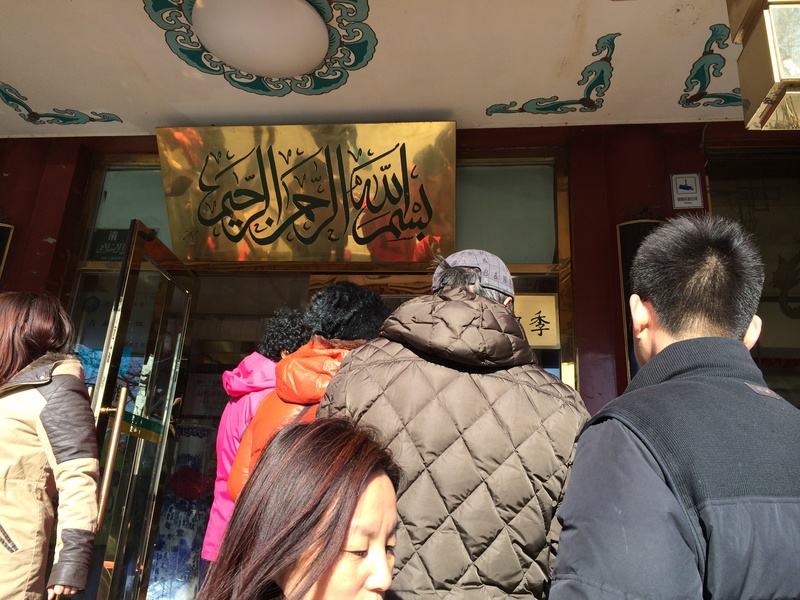 Someone else later confirmed that there is indeed an entrance fee, but only noted in Chinese. That being said, for all the fun that can be had at 20 RMB a chair-sled for unlimited time (plus 30 RMB deposit that you get back at the end, sort of, not quite clear again while you are going through it), and the entertaining surroundings while you wait, the hassle was totally worth it! Lake HouHai was frozen over with thick ice but you could actually see below the surface to about 6 inches, which was a little unnerving. We picked sleds that looked a little decent (by which I mean the seats had carpet patches, and the mock steering wheels had not fallen off). 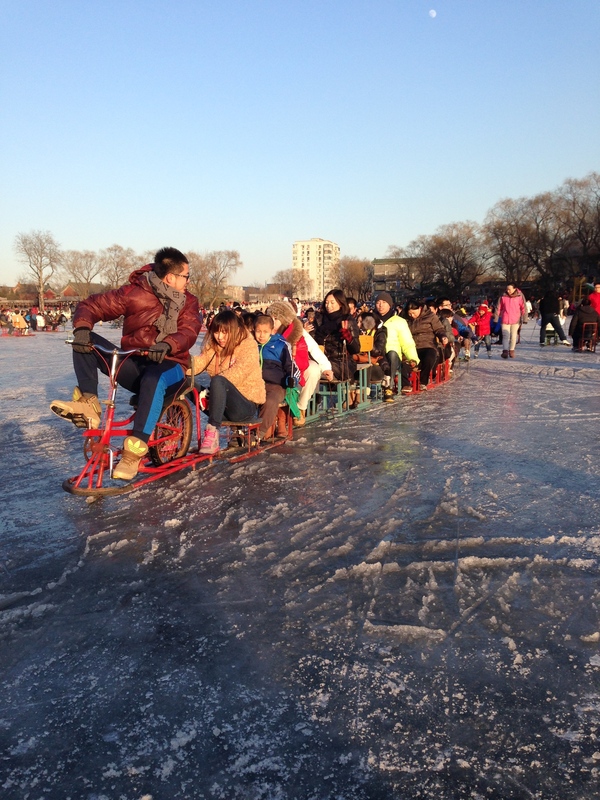 But the ease with which those wonderful contraptions skidded over the ice was unbelievable. 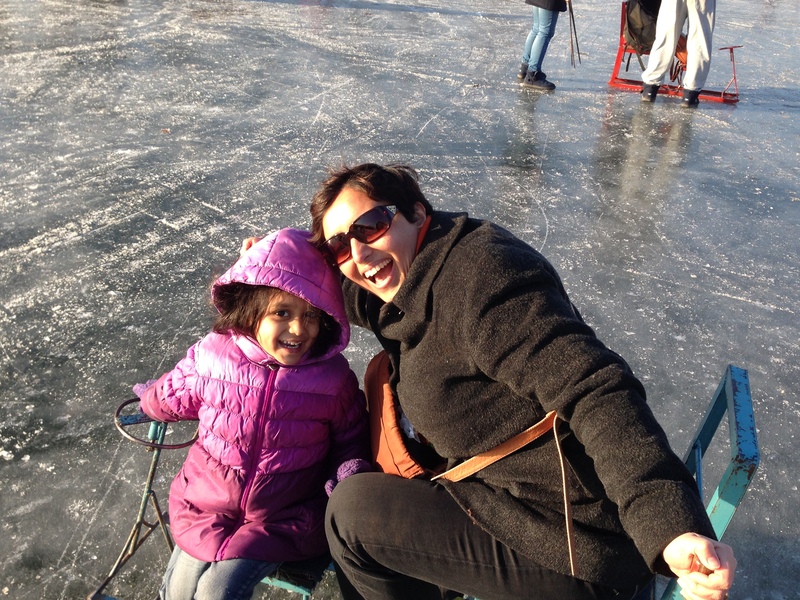 Saachi parked on the stool in front of me on one sled, while George sat on another sled, and off we went! It took a little getting used to steering with those screw-driver-poles I mentioned earlier, but boy can you move on those things! Woman on Instagram? Man carrying his ladies’ purse. 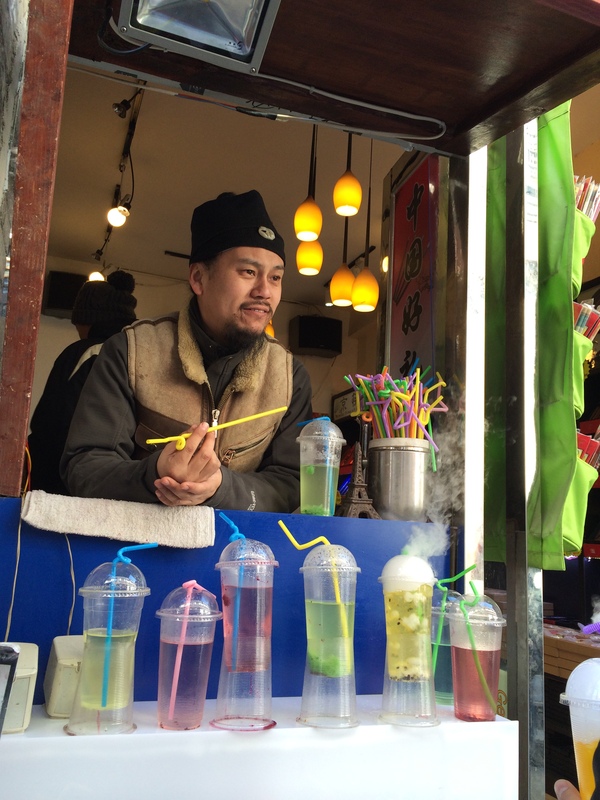 Usual Beijing! 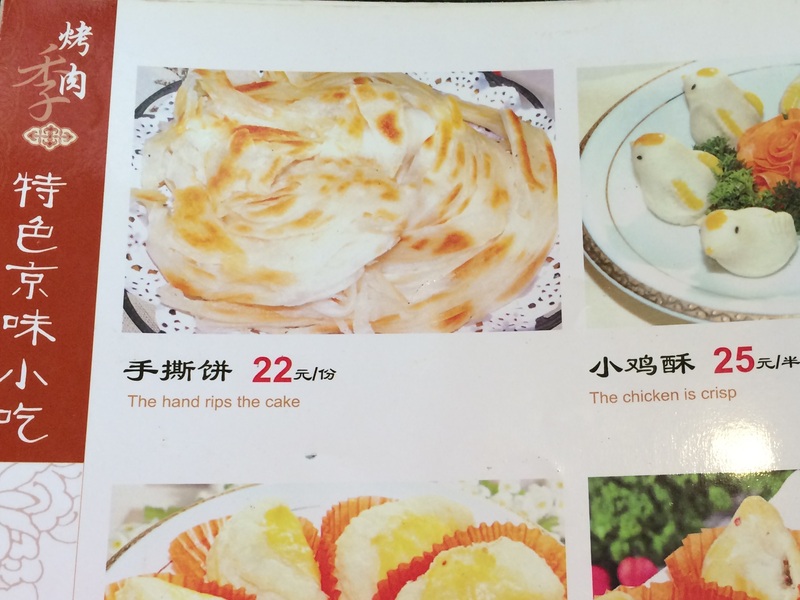 What *ARE* those things called? George promptly started to get his sled into slides and drags, while I found myself enjoying the speed going straight, or shall I say, as straight as I could while trying to escape crashing into the dozens of chair-sleds and people on ice skates slipping and sliding around us in all directions. Another hazard to watch out for were patches of thinner ice that had been covered by wooden planks and manned by staff ‘workers’ standing by to warn people off. It was madness, but it made you feel so alive! 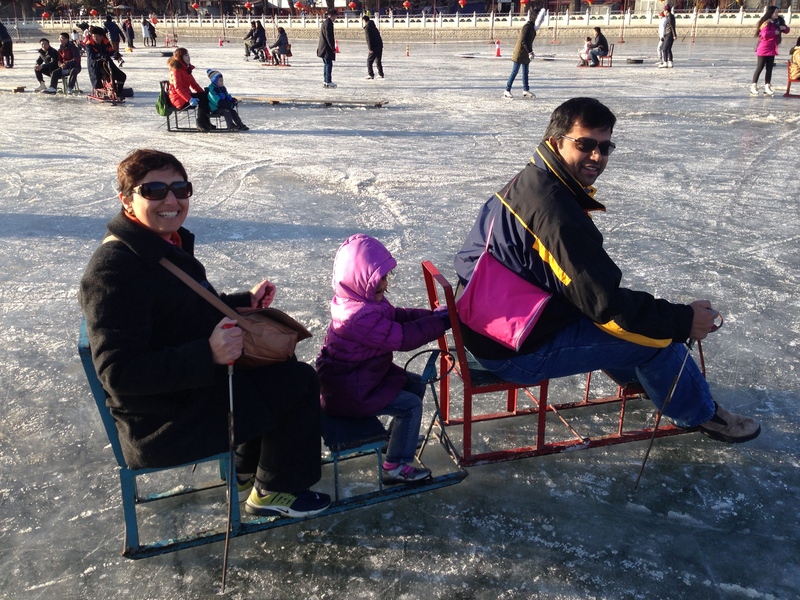 It was entertaining to see the variety of people on the sleds. 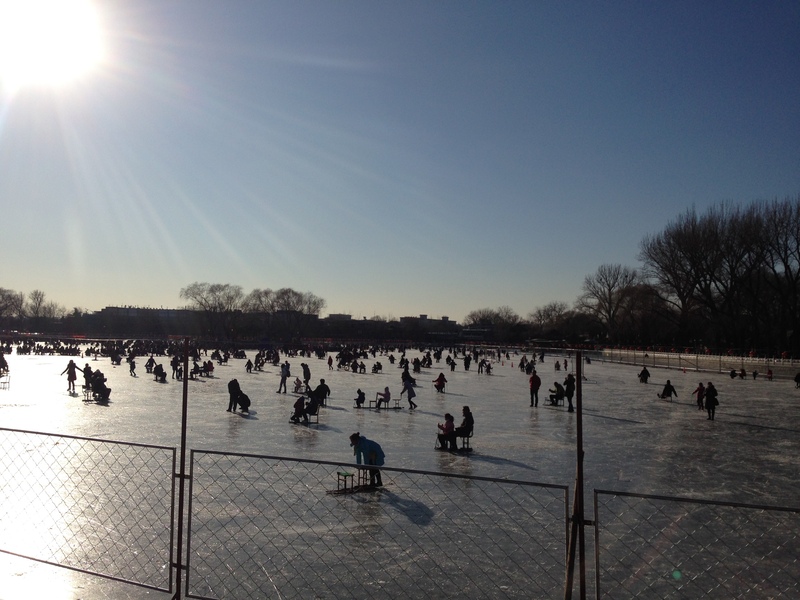 There were the love birds, two to a sled perched on those tiny seats, and there were grandfathers and grandmothers with little kids. 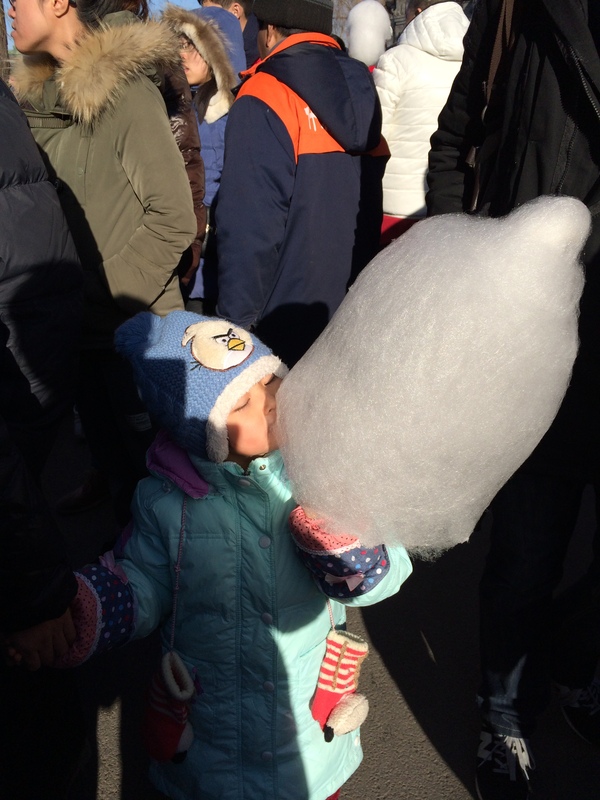 There were parents and kids like us – Chinese and expats. 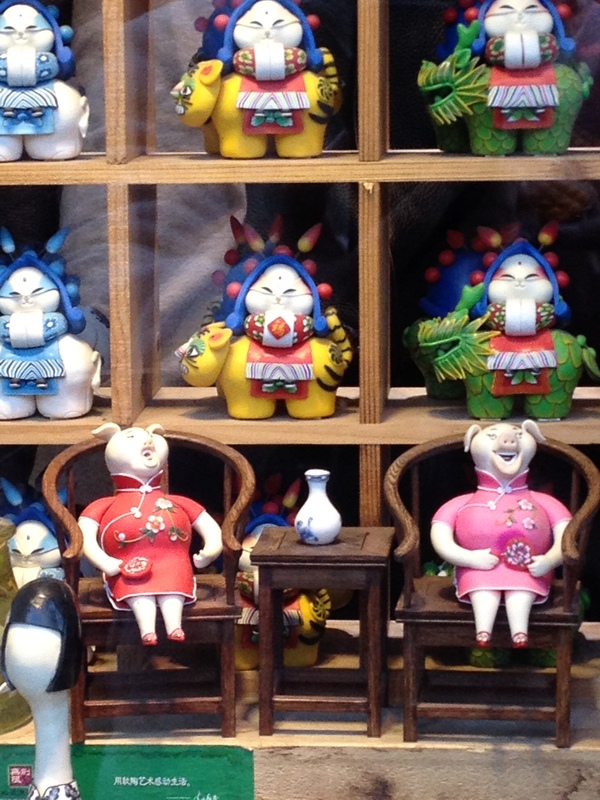 There were also single people, mostly young and middle-aged. But the most entertaining were groups of young people who were forming long trains with their sleds – which is nearly impossible to do with the only thing tying the sleds together being the people sitting on the little stools in the ‘front seat’ holding on to the back of the next sled with their hands and feet, constantly losing grip or, better yet, sliding right off their seats and landing on the ice (hilarious sight! J)! The one thing all types of people had in common were the exhilarated looks with sparkling eyes and huge smiles plastered across their faces. 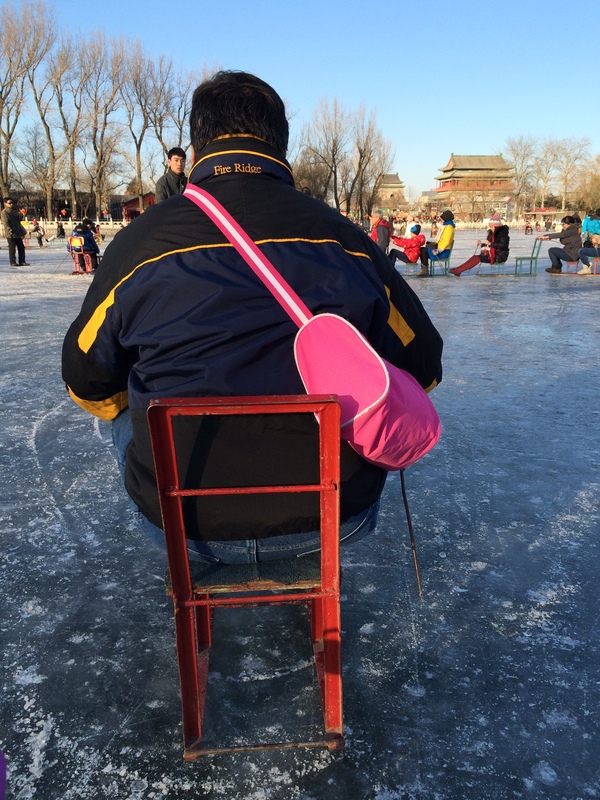 All in all, if you are an expat or a visitor to the Jing (the capital) in the winter, the chair-sledding experience is not to be missed!